College football serves and is served by many gods, old and new. Here, week after week, we’ll build a temple to them, installing saints and erecting graven idols as we go. The temple is made of words and pictures from the Internet. Just go with it. Bless this Les. Same as he ever was. Where to begin with this week’s player honors? Chronologically, with quarterback Munchie Legaux back in action in a weeknight game for Cincinnati, running joyously on a leg that’s somehow still in one piece after last season’s grisly injury? In the South, where Mississippi State running back Josh Robinson staged his own one-man performance of Katamari Damacy? In the Midwest, where Nebraska’s Ameer Abdullah recorded 341 all-purpose yards and moved into second place in Big Ten career all-purpose yards, trailing only Ron Dayne? On the high seas, where Navy’s Keenan Reynolds put up a career-high 251 rushing yards and broke the Midshipmen’s career touchdowns record? In the dead of night, where Ohio State defensive end Joey Bosa’s sack of Christian Hackenberg using one of the QB’s own blockers as a bludgeoning tool has already entered the realm of Buckeye legend? Or is our all-seeing gaze fixed on the unlikeliest of places and on the unlikeliest of events: a fat guy passing touchdown? World, meet Razorbacks offensive tackle Sebastian Tretola, whose school bio lists him as a robust 6-foot-5 and 350 pounds, and whose forthcoming biopic will be titled 350 for 350. Honor him. Remember when Dantonio was the wear-a-tie-or-you’re-suspended guy? It wasn’t that long ago, yet within the past calendar year alone, we’ve seen him shouting out Rich Homie Quan on live television and winning a Rose Bowl, and now he’s got jokes! Mark Dantonio’s got puns in his mouth! Michigan players planted a stake on the Spartan Stadium turf after running onto the field before the opening kickoff. Michigan State players and their coaches took notice and decided to keep exacting their revenge until their final offensive play of the game. “It just felt like we needed to put a stake in them at that point,” Dantonio said when asked about the final score. A quick word about this tent-staking of the Spartans’ turf: We saw this instrument referred throughout the day as both a “dagger” and a “spear,” which made the “it’s a tent stake, y’all, chill” revelation a touch anticlimactic. A modest proposal: Bring back the Peloponnesian War draft. Dantonio would probably approve. He’s still the wear-a-tie-or-you’re-suspended guy, make no mistake. He’s got the whole world in his hands, and his hands are slowly clenching into fists. How prolific is @TCUFootball's offense this year? In yesterday's 82-27 romp over Tech, we shot all the pyro we ordered…for the season. Please accept this scratch-and-sniff sticker, the sum total of everything your work this weekend has earned you. Find what you love. Do that, and you’ll never work a day in your life, they said. Follow your bliss, they said. 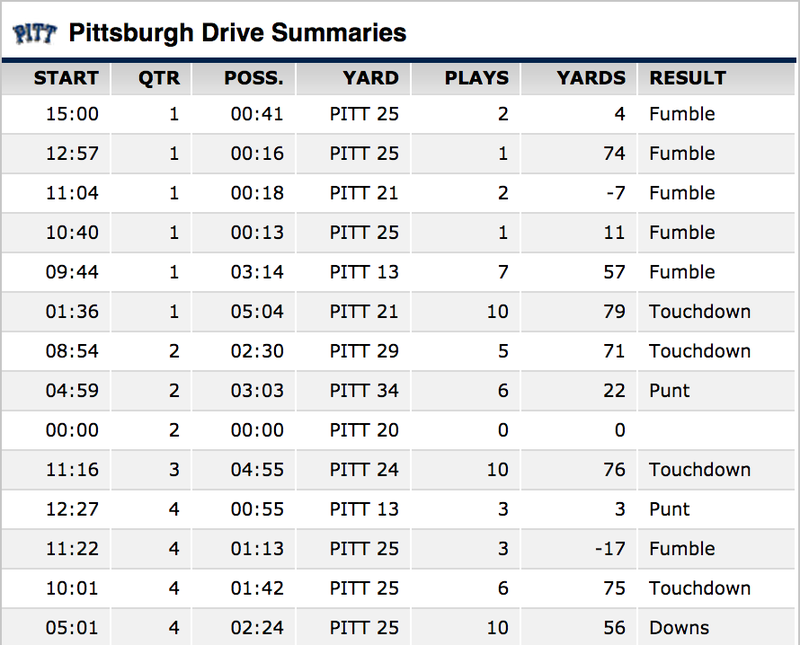 Pitt’s drive chart from Week 9 should be preserved in amber for the education of future generations. And stored in a vault at the CDC.